What you are seeing here isn’t some prop from a science fiction movie, but the Quill concept by British designer Halil Buzcuoglu. This car is designed to drive over snow and land “with equal efficiency”. Whoa, does that mean that it can drive through snow as fast as it can on land? That would be quite something, considering those tank treads on the front of it. The Quill can hold two passengers, and it has a large windscreen for a front view, and integrated cameras for a rear view. It has a joystick for steering, and we would imagine it would be capable of a lot if it were actually built. Well, we suppose that’s all we can really say about the Quill. 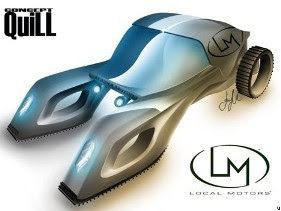 Check out that crazy frame, it’s from Local Motors Halil Buzcuoglu.